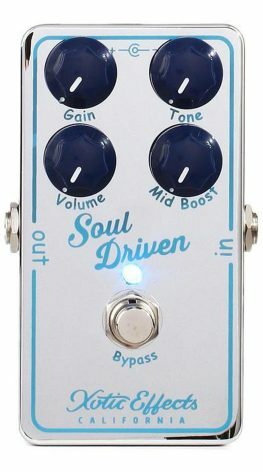 Soul Driven adds “soul” to your sound by producing creamy boost and overdriven tones with just the right amount of compression. The pedal is equipped with incredibly flexible tone shaping options to help customize your sound while preserving your guitar’s tone. The “Mid boost” knob pushes the mid-range frequencies creating rich dynamics and the “Tone” knob (not just your ordinary tone circuit) can be set from a super tight bottom end to “in your face” highs. Soul Driven will help you dial in the “sweet spot” every time. Tighten up your tone even further by accessing the Bass Boost dipswitch which can be accessed by removing the back plate. Cut through the mix by adding up to +6dB @ 125Hz for fatter boost and overdriven tones.